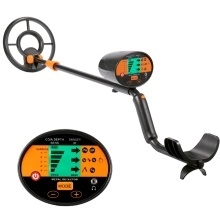 With your metal detector, you can hunt for coins, relics, jewelry, gold, and silver at any time, as well as metal. The detector is versatile and easy to use, and is also very popular among gold diggers. Come and try it, you will not be disappointed. With your metal detector, you can hunt for coins, relics, jewelry, gold, and silver just about anywhere. The detector is versatile and easy to use, has a long service life. Headphone jack – Let you connect headphones and operate without trouble. LCD – Show the probable type of metal which is being detected and low battery display. Waterproof search coil – Can be used in shallow water. The search coil is waterproof, but the control housing is not waterproof. Adjustable stem – Let you adjust the detector&apos;s length for comfortable use. Arm support – Let you carry and operate your detector comfortably, and make sure this detector is easy to use for people of different sizes and ages. Special function – With Pinpoint button for accurate detecting & 3 tones for three different metal catagories. Unwanted target elimination – You can set the detector not to respond to some objects.